Recently, I traveled with new friends to Sedona, Arizona for a road trip to visit the sites. We didn’t have a plan when we started. So when we heard about great locations, we updated our adventure daily. We had a group of 4 women. Three knew each other before this trip and traveled together a few times. I was the newbie in the group. We had a great adventure and a wonderful time! There are many hotel options available in Sedona. We stayed at Sedona Pines Resort. You can book it on Booking.com or if you have a timeshare, book through the timeshare as part of your membership. It’s a nice little place for the price and location, a good value. I made a list of the places we visited, in order of my favorites. We averaged 10K to 30K steps per day. How do I know our steps? I wear a Fitbit, and it tracked our steps, heart rate, sleep and more. This itinerary requires being able to walk a bit. I hope these great destinations are your bucket list! If not add them because they are must-see locations. I consider the number one spot when visiting Sedona is the Grand Canyon. The nice aspect about where we stayed is we could get to and see all the places on our Sedona bucket list! We started at the Grand Canyon West entrance. From there we walked the Million Mile Walk which is not strenuous because it’s paved and goes along the top of the canyon. We then went to the Grand Canyon East entrance. It’s referred to as “Desert View.” Although Desert View East is part of the Grand Canyon South Rim, it is a separate entrance with a self-contained visitor area with a campground. This is a full day trip. Don’t we look gorgeous in the photograph below? Isn’t the Grand Canyon spectacular! 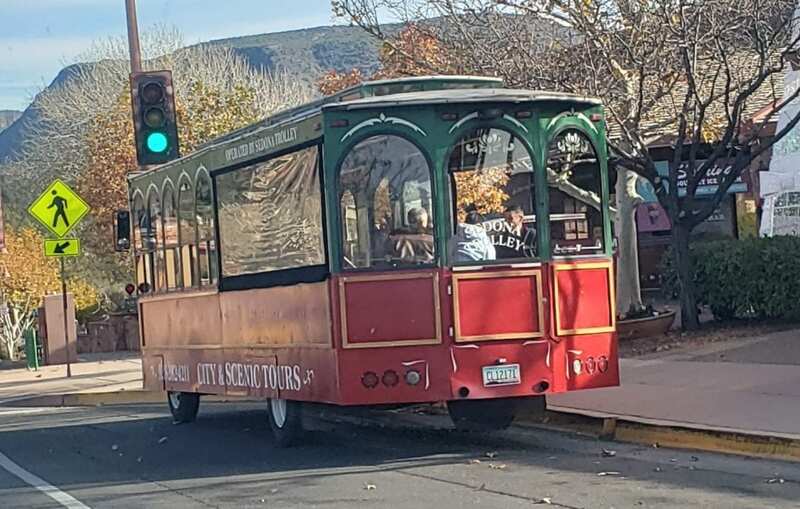 If you are a shopper, which I am not, you could spend a full day shopping in downtown Sedona. There are some great hiking spots close to downtown including Airport Loop, Red Rock Loop, Cathedral Rock, West Fork Trail, Chapel of the Holy Cross and Coffee Pot Rock. We ate dinner at the Cowboy Restaurant & Bar. It serves bison, and it is excellent. We loved our meals and the fabulous staff. Montezuma Castle isn’t a castle the way I think of European castles. This National Monument is one of the best-preserved cliff dwellings in North America. There is a twenty room high-rise apartment on one walkway. There is also a towering limestone cliff houses that demonstrate the Sinaga’s ingenuity, ability to survive and ultimately, prosper in an unforgiving desert landscape. They survived the harsh land with little water using the sun for natural heating and air conditioning for their homes. Visit Montezuma Well if you want to see an ancient well that is not drinkable with no fish but lots of leeches. The Well, filtered by a great natural filter system made the water cleans. The water supplies a river outside of the Well. At the end of the trail, you’ll discover a tranquil stream. Along the path, there are cliff dwellings perched along the rim. The walkway meanders to massive pueblo ruins and an ancient pit house. I loved Montezuma Well. This monument is unique. The trail is a gentle walk with some elevation, so being able to walk up and down is necessary. This is the location of a trading area on an ancient trade route of the Sinagua people. The Pueblo village is an old village built by the Sinagua people and shows us how they lived in Arizona more than 2000 years ago. Visiting this National Monument requires being able to walk up and down lots of stairs. However, this is a gentle walk which meanders to the Pueblo site. There are lots of places to rest and take in the view along the pathway. Some locations have benches for relaxing and admiring the view. The four of us walked Lava’s Edge Trail surrounded by ponderosa pines which smelled divine. We walked snowy paths over loose cinders, lave rocks, and rough basalt along the jagged edge of the Bonito Lava Flow. It ranks as one of my favorite hikes ever. It is very peaceful. I think we saw only four other people on the trail. This walk is gentle and serene. The U.S. Forest Service section of the trail is two mi (3.2 km) round-trip. I loved it. It is beautiful. The mountain “San Francisco Peak” is named by the native people, to honor Saint Francis of Assisi. I have no idea why the indigenous people of Arizona, would name a mountain after a Saint in Italy. Needless to say, the missionaries had a significant influence on the native people in Arizona. It’s a beautiful mountain that I saw on the way to the Grand Canyon. The link above provides useful background information and additional pictures if you are interested in learning more San Francisco Peak. This is a blast from my past, and since the ladies I was with are Rv’ers, it is one of the funny highlights of our trip. When we saw the sign for Route 66, we all hopped out and took a selfie moment and photos of the sign. I don’t think I have ever been on this famous route before. We took time to giggle at ourselves. Route 66 – sorry it’s out of focus 🙂 we were laughing pretty hard. We went to Jerome to see the Ghost town and drove Route 89A. The Ghost town is well preserved, and the shops fascinated us. We survived the windy highway drive which is extremely steep and curvy – so glad I wasn’t driving! Thank you, drivers, Jonny and Julie. Before you drive route 89A, enjoy a delightful lunch at Grapes Restaurant and Bar. The friendly staff and great food will make your day. If you are interested in ghost tours, one of my friends, Linda, recommends this is a good ghost tour. We stopped in and visited the tour company. At Jerome State Park take a hike after your big lunch. The state park offers rental cabins if you want to spend the night in Jerome. Since we are talking about ghosts, if you are interested in paranormal travel, we have you covered. One of our travel writers, William, can take you back to your past. To book a visit to your history, contact him, and he will take you on vacation with your ancestors. Ancestor tours are popular now because of DNA tests like Ancestry and 23 and me teach us about our past. Red Rock Trail and many other day hikes surround Sedona. Hike the Devil’s Bridge Trail, and the view is fantastic. My friends and I went hunting for Vortexes. We hired a guide to find several vortexes. 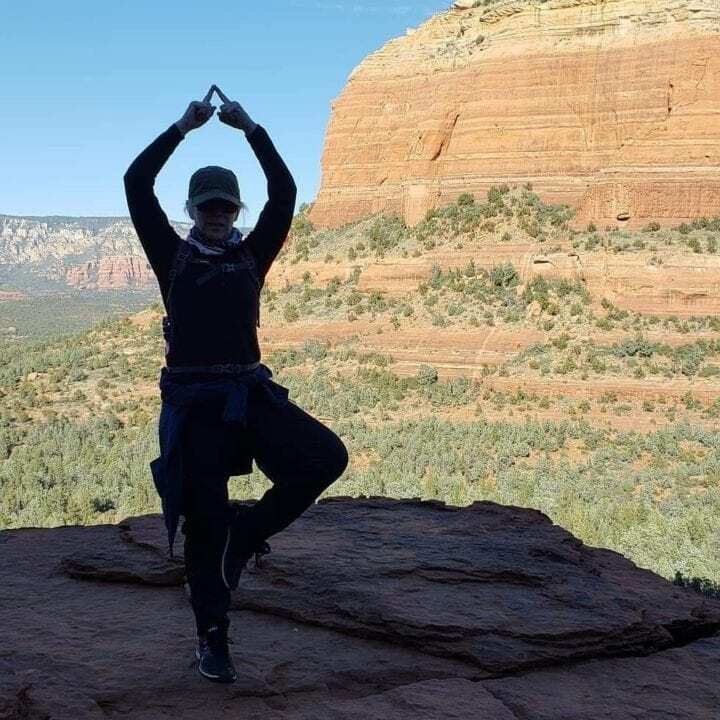 I think she is an excellent value because she treated us like friends while providing lots of general Sedona highlights and information about Sedona trails. I recommend hiring Back to Earth Sedona Tours, ask for Sharon Day. Ee loved her tour. On her tour, we did yoga with her and a beautiful meditation after a short hike. The photo below shows the relaxed meditation location on our walk. Red Rock is a beautiful place to take evening photos. Sunset is gorgeous, enjoy the moment. If you chase light, as I do, hike here is the evening. I also want to recommend hiking to the top of Devil’s Bridge. Devil’s Bridge is my favorite hike in Sedona even though the area is full of hiking traffic. Because of this hike, I now feel less fearful of heights. I must have found a positive energy vortex there! Here I am on the way to Devil’s Bridge. The photo below, taken by a fellow hiker, who offered a helping hand shows how friendly the area is. Find your Zen and be comfortable with who you are. I am striking a little pose before I reached Devil’s Bridge. There is a train ride that goes through the Canyon if you want to take a day trip and see the area by train book a ride. It is charming, but we didn’t do it because we preferred to use our days hiking trails. Coconino National Forest for more hiking. 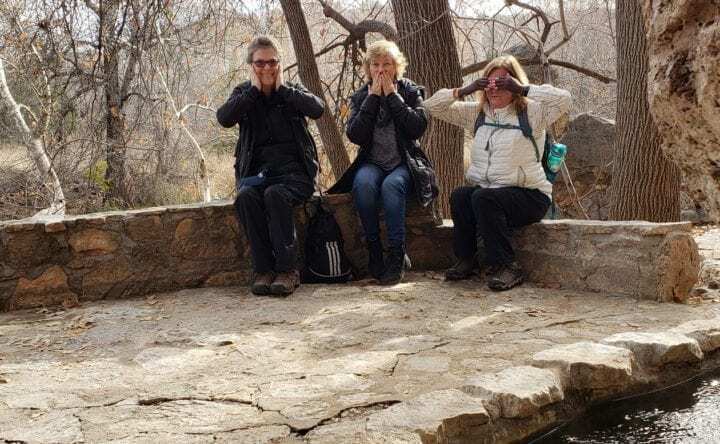 Here is my group at the end of the trail at Montezuma Well. Let’s end our Sedona story on a beautiful moment, a perfect Sunrise on Windmill hike! Have a great day!! In case you are looking for the best travel protective gear, try our article about The best Travel Protection Gear. Travel tip: I think the perfect time to visit is in the Fall through Spring. Summer would be too hot for me. Early winter, December is a beautiful time to go hiking. Travel tip: Want another National Monument with light tourist traffic try Little Big Horn and Wenatchee River and Tumwater Creek. I loved reading your Sedona/Grand Canyon travel notes. I relived every day (I was one of the travel partners). This trip was the best. So many great memories. Every view was picture worthy. Hi Linda! It was a great trip – thanks for sharing the experience with me and all of us. Memorable, wonderful adventure.